• Version used for the screen captures: WS.WebTV Professional 3.0.3 and 2.2.0.3 (all extensions enabled). Some options/features might be different, respect your WebTV, depending on the installed version and extensions you have purchased. The function of a GeoIP service is to find the geographical location of an user from its IP addres. This sevice is required by the Site/Geo Blocking extension and used by the user management system. • Provider: (Since WS.WebTV 3.0.3). This option will only be displayed if the PHP GeoIP extension is enabled in your server, and it will allow you to select the provider/system used for getting the country code from the user IP. NOTE: If you select "PHP" the options "Service URL" and "Response Data Index for Country Code", that you'll find below, won't be displayed. After the previous, you just need to provide the URL to the script and country code data index as explained below. 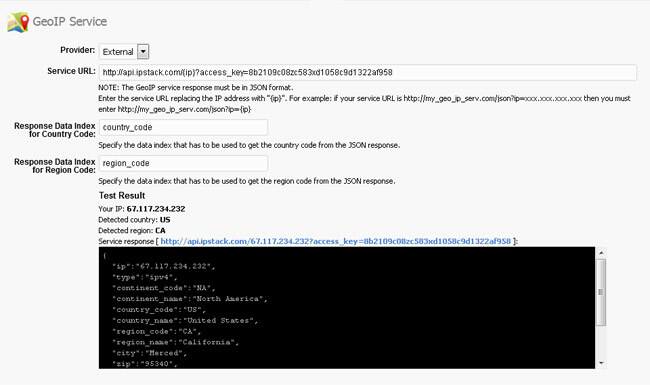 • Response Data Index for Country Code: Specify the data index that has to be used to get the country code from the JSON response. Below you'll find what you need to enter into these fields, in order to use the aforementioned GeoIP services below. For those cases where your GeoIP service incorrectly identifies the country for certain IP, here you can specify the correct relationship between them. • One entry per line.